This post is sponsored by Mina Harissa. You almost didn’t get to see this recipe. Not because I was in a tra-la-la-la, I’m-just-not-gonna-post-on-Friday-no-siree-Billy-Bob-Thornton mood.. or because I had sooooo many beeeeetter things to dooooo than post on my bloooog… and not even because I felt like you and I have been spending too much time together and I figured we could use a break. Yes, you almost didn’t see this recipe, and not because I was trying to punish you with a scrambled egg smoothie, but because I almost ate the star ingredient before it had a chance to become a dish. That’s the harissa. I almost ate all the harissa off of a spoon. …And not because, NEWS FLASH, I learned peanut butter is just RIDDLED with calories, and I needed a replacement for my highly needy spoon (and face). …but because harissa is sinfully delicious…even on a spoon…especially on a spoon…particularly on a spoon with peanut butter. Just look at this skillet. How could I not show you something this warm and cozy for your trendy hipster brunch this weekend? Because, you really, really need this for your trendy hipster brunch. It goes exceptionally well with harissa bloody marys, juuuuust putting that on the brunch table. Slap some-uh-dis on your English muffin and call it Eggs Benedictouka. Should we maaaaybe address the elephant in the room? 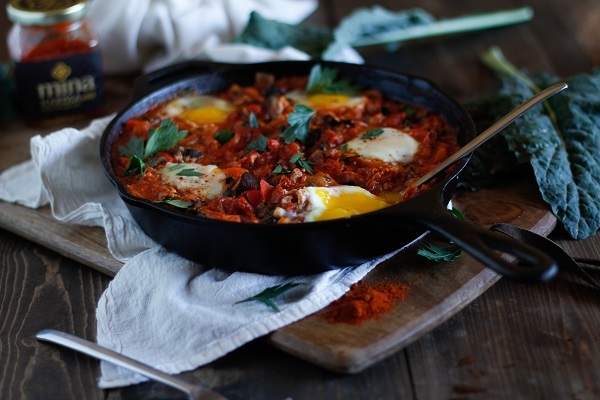 Shakshouka < – the elephant. What exaaaaactly is it? 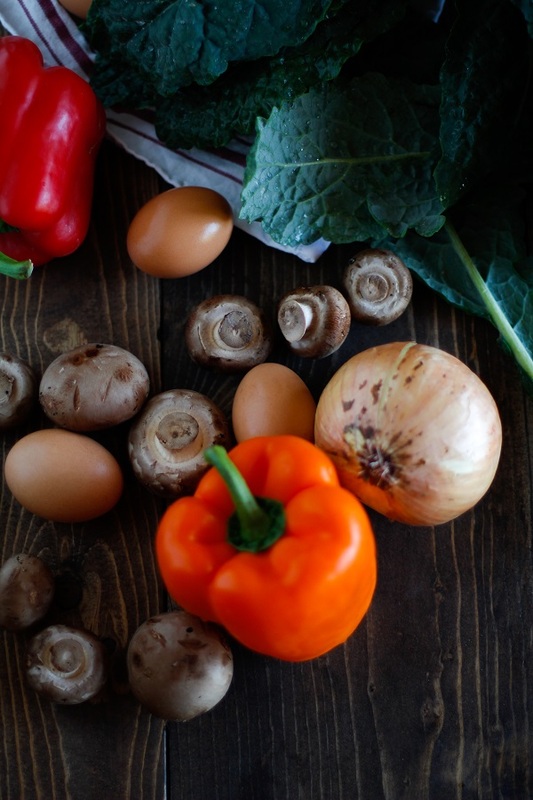 Shakshouka is a traditional Tunisian dish made with eggs poached in stewed tomatoes, chilies, onion, and ground cumin. It’s typically served for breakfast or lunch, and is also made in a number of North African countries. It’s particularly marvelous with harissa paste swaddled all up in it. Although it isn’t traditional to add mushrooms or kale to shakshouka, I did so anyway, which gave the dish a hearty oomph. 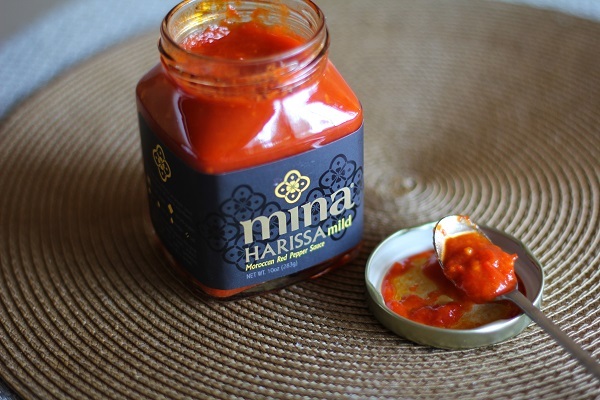 Harissa is a paste made with chili peppers, bell peppers, garlic, and vinegar. It’s widely used in North African cuisine. Like any chili-based sauce or paste, harissa can be made mild or spicy. I used Mina Harissa‘s mild harissa paste for this recipe, which added a lot of flavor. Next time I make the shakshouka, I’ll flame ‘er up with the spicy version of the paste. The paste made the dish particularly easy to make. All I did was stew the veggies with the harissa paste and call it a recipe. Super simple, magically delicious. Your eggs are dying to get poached. In a 10-inch cast iron skillet, heat the oil to medium. Add the onions and peppers, and sauté, stirring frequently until softened, about 8 minutes. Add the mushrooms and garlic and continue sautéing another 3 minutes, until mushrooms have softened. Add the ground cumin, cayenne pepper, salt, and harissa paste. Sauté an additional minute. Add the diced tomatoes and bring to a full boil. Allow the mixture to cook about 10 minutes, stirring occasionally. Add the chopped kale leaves, stir well, and cook an additional 10 minutes, stirring occasionally. Dig small wells into the shakshouka and carefully crack eggs into them. Cover the skillet and allow the eggs to cook until whites have firmed up, about 10 to 12 minutes. Scoop eggs and sauce into bowls and serve with toasted bread. I have seen harissa before, but really didn’t know what it was, or how to use it. But it sounds really versatile, and I bet it is amazing with lovely runny eggs and kale! Yum! Heck yea, it’s super easy to cook with and really adds a lot to a meal. I bet you’d love it, my dear! OK. That smoothie. YES I WANT TO SEE IT. What the what? I am SO intrigued. But, this skillet. Give it to me. 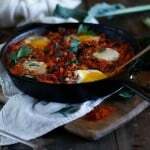 Let me swim in its runny egg, Harissa (YUM!) goodness. Ohhhh Tay…I always knew I could count on you for supporting a scrambled egg smoothie. You da, girl….you da! Get on that harissa, sister! Put it on your everythang, love! HARISSA! I am learning more and more about this magical paste/seasoning/sauce with every second that passes. And thank you for addressing the elephant in the room because I had no clue what shakshouka is. But now that I know, I’d like for this to shakshouka me in the face. Lastly, I’m both terrified and at the same time ridiculously curious about that smoothie. You MUST show us. But I’m sure you’ll find a way to make it look pretty…somehow. HARISSA! I was 200% convinced that I’d use too much of the spicy version and make an inedible Shakshouka, which is why I went with the mild. Totally thought of you and your harissa mishap, ha! Now that you and I are both well-versed in the art of harissa, we should make all the things with it. This recipe looks so flavourful, Ju! Love eggs and mushroom! Awwwww Oliviaaaaa I love you, too, dear! I’m glad you get a knee slapper out of my posts 😀 Hope you have an excellent weekend! This looks amazing! Love the flavours and colours, so vibrant and delicious! Hi Susan, thanks for catching that! I made a note in the recipe to use 4 to 6 eggs 🙂 I hope you enjoy! Stay tuned for the smoothie! Thanks, Julia. I have saved the recipe and plan to make it soon. This is the second reference to Harissa in the last couple of weeks. It looks like I need to get with the program. This certainly is an impressive looking egg dish. And egg dishes get my attention. 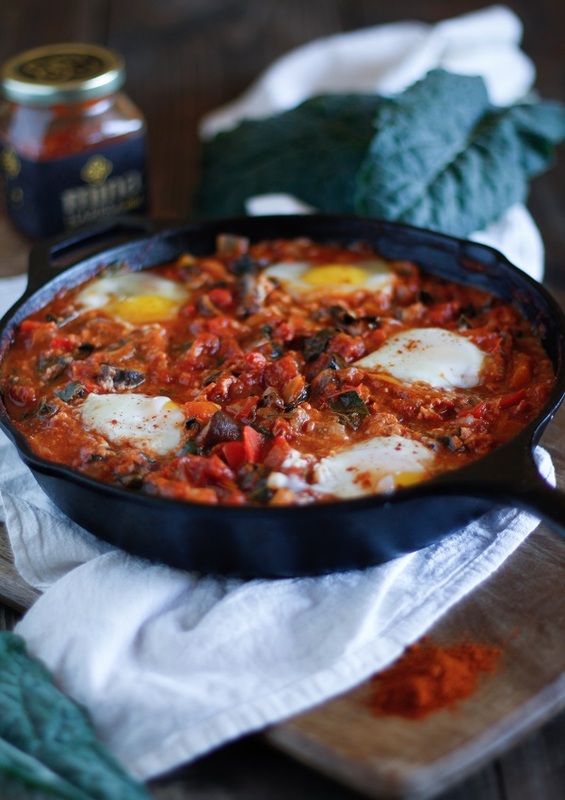 It’s a sign – you’ve gotta make something with harissa 😀 If you enjoy eggs, this dish is definitely up your alley! 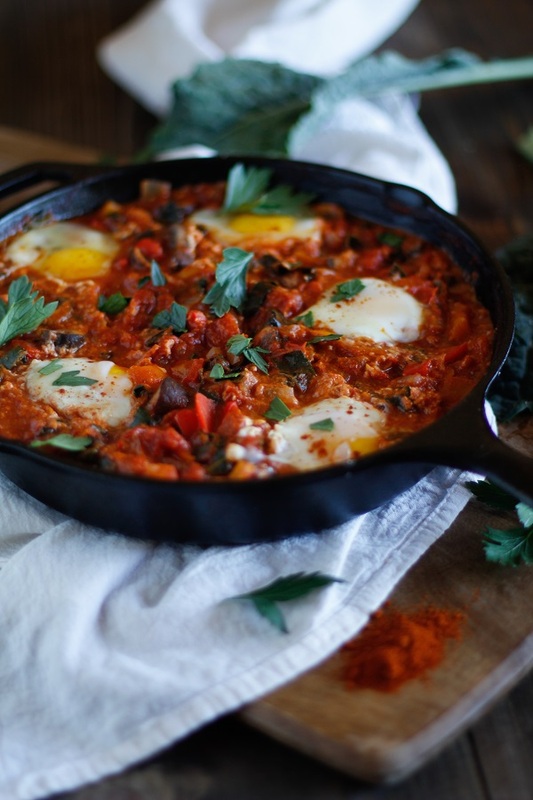 I love shakshouka and love your harissa addition Julia! I also love your photography and styling! 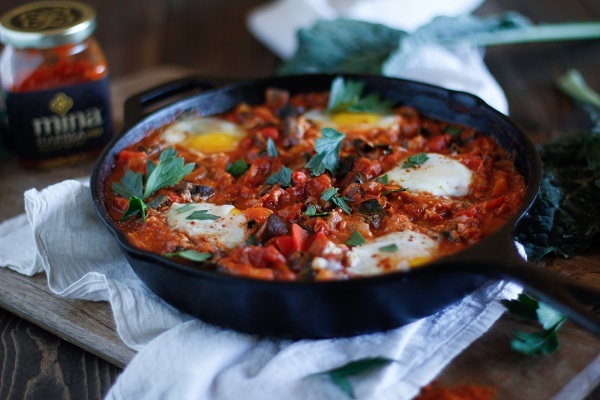 Great to hear you’re a fellow shakshouka lover, Millie, and thanks so much for your kind compliments! I hope you’re enjoying the long weekend. I have never tried cooking with harissa! What a shame! This looks so delicious! Can’t wait to try! I’ve experienced the eating harissa off a spoon phenomenon. It’s always a good idea. 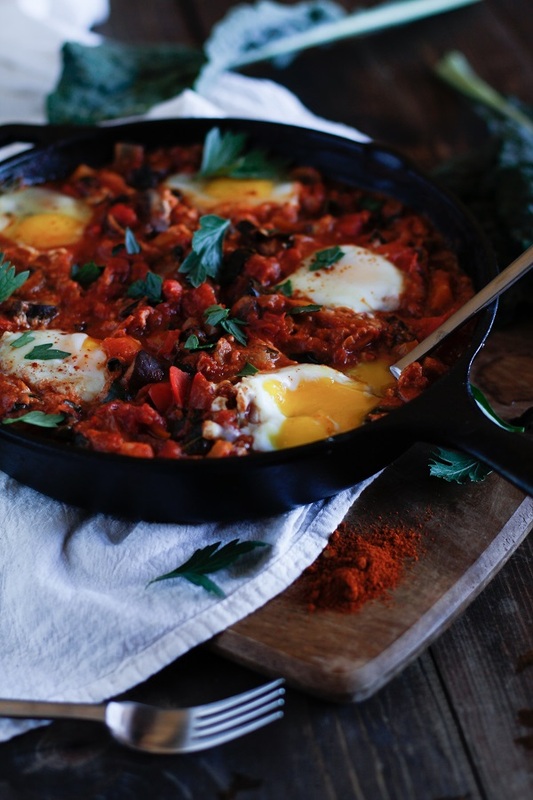 🙂 As a HUGE shakshouka lover, I’m super into this veg-ed up version! Thanks for the recipe! Is the mixture supposed to boil for the entire time after it’s first brought to a boil, or is the temp lowered to medium after it’s brought to a boil? It started to burn slightly for me right before I added the eggs so I lowered the temp to medium. Just curious on how many servings this recipe is? Thanks!